The 47C replaces the 45C. It has similar dimensions, but has been reworked to improve fit and finish. The 47C enclosure is designed to make mounting, aiming and servicing your camera as simple as possible. The cable gland on the back allows you to use most pre-made cables without disassembly and provides a water-tight seal around one or more cables. The enclosure includes a stainless steel mount providing pan and tilt. The enclosure design also provides roll axis adjustment, allowing precise aiming of the camera. All aiming adjustments can be made after the camera is mounted and aimed, taking the guesswork out of focus and f-stop settings. The 47C enclosure can handle a variety of larger body cameras, cameras with larger lenses, and cameras with ringlights. 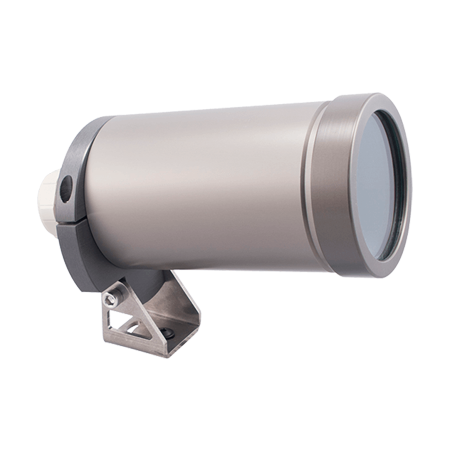 The enclosure is available in a variety of standard barrel lengths from 6″ to 13″. Custom barrel lengths also are available. Optional accessories include an air curtain faceplate and fittings (a press-in air hose connector and a pressure relief valve) to allow air purging and cooling, heat-absorbent glass for looking at hot objects and polycarbonate or acrylic windows for specialized applications.